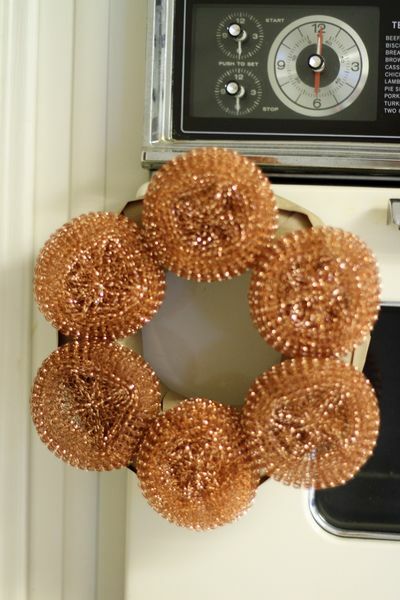 Tell me what you think about this copper kitchen wreath. 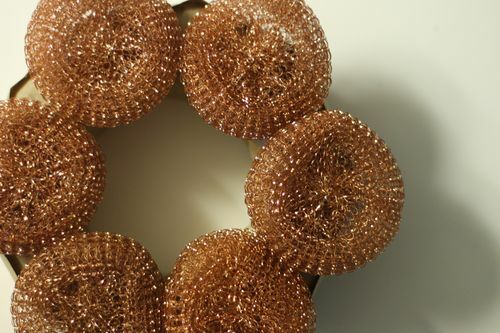 I thought these copper things were cool looking when I found them at the dollar store, and I imagined they’d make a humorous kitchen wreath. I can’t tell if I love it or hate it. 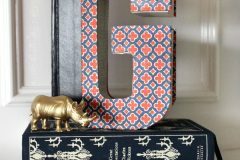 I keep telling myself it’s very Anthropologie (I’m pretty sure they’d make the copper thingies into a fabulous display. Not so sure I rose to the Anthro level with this particular project). So, what do you think? Flop or fabulous? Would you make one? What could I do to make it better? 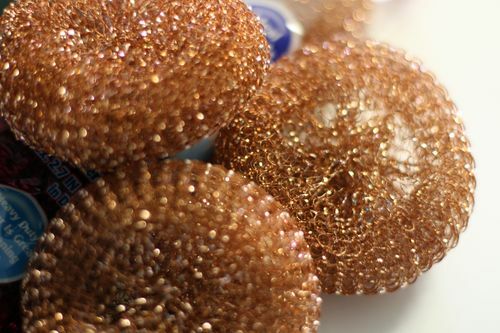 Yes, the copper things are dish scrubbies (aka “Wire Scourers”). Three for a dollar! I used four packages to make this wreath (although an extra package wouldn’t have hurt). Maybe this wreath would be better if I added paper towel flowers or tea! I think these scrubbies are kinda pretty and sparkly, though. 1. Cover a green floral wreath with kraft paper strips. I have a roll of brown kraft paper from the mailing supplies display at Dollar Tree, and it is in my top five favorite supplies from the dollar store. You get a lot of it, and you can use it for all kinds of crafting. I covered the green wreath with paper so it would blend better with the copper scrubbies. You can also use a different type of wreath form (that doesn’t have to be covered). 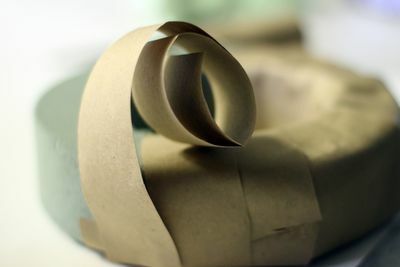 To cut the kraft paper strips: cut an 18″ piece of paper from the roll. 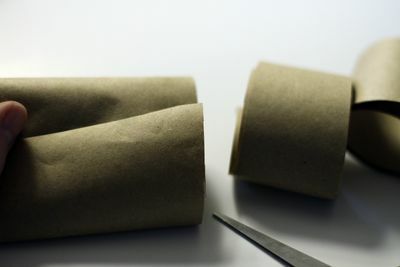 Let it roll up onto itself, and cut through the roll in 3/4″ strips. To wrap the wreath: Anchor the end of a strip on the wreath with hot glue. Wrap strip of paper around wreath, overlapping each strip a bit to completely cover the wreath. Glue the end of each strip to the wreath, and repeat process until entire wreath is covered. 2. Hot glue scrubbies to the top of the wreath. 3. You could stop there, but I added scrubbies around the edge of the wreath, too. I always have trouble photographing things that are supposed to hang on the wall, so I hung this on my oven. I think it kinda looks cute there, though. Not that it can actually hang on the front of the oven. Ha. 4. Embellish as desired. I tied a floppy satin bow to mine because I’m accessory challenged, but I’m sure you would make yours look amazing! I thought these silver scrubbies were cool, too. They look like rosettes. Okay, spare no feelings. Tell me what you think! G.E.N.I.U.S. 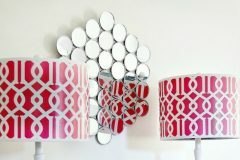 What a cute idea for sprucing up your kitchen or your laundry room!!! SO FUN!!! I really like it, but I would do a second layer underneath instead of around the sides. I love this for my mom, who is obsessed with copper in her kitchen! Also a turquoise accessory would work best, the color of copper oxidized. Honestly, I *want* to like it… but I’m not there yet. I love the materials though, and I agree that there’s potential. If I had to make one, I would either pull the scrubbies apart either into smaller “rosettes” and use them to fill the wreath more completely. Or, I would pull the scrubbies into long ribbon-like pieces and wind them around the wreath, but that wouldn’t be like your wreath at all. Okay, upon further reflection, here’s what I would do. a small wreath form, 6-7 inches, wrap it in ribbon-like pieces of the scrubbie. Then pin whole scrubbies randomly around the wreath. Maybe add a cool-looking button through the pin so the rosettes look more “flower-y”. Then, hang above the sink. When I need a fresh scrubbie, I can just pull one down. Pretty scrubbie storage! I like it, but … I think it’s still in the inspiration stage, and needs more follow-through. I’d love to see what others do with it, and with the silver ones. Sorry. Even though I find most of your ideas charming and adorable, I think these flop. ;) However, I’m a tough cookie when it comes to wreaths, though, and only like about 5 of the 100 wreaths I’ve come across on various blogs. I like the pretty scrubbie storage idea. LOL. I think it’s a cute idea, love the color and texture, but I don’t find it pleasing to the eye. What about if you strung a wire through the center of them all and then formed it into a wreath? You’d be seeing them from the side and maybe it would be less obvious what they were. Just an idea…good for you for experimenting….that’s how we stumble upon great ideas! I wouldn’t mind it with a different bow maybe. But then again, I am the girl who stops and touches the fluffy car shammies at the Dollar Tree each time I am there and tries to figure out how to make a something cuddly out of them. Well, I think it rocks. I think it’s a good first draft. You are on to something, but it hasn’t quite arrived yet. Perhaps adding the silver ones or pulling them apart? I feel like it needs something more. I love that you tried. I made corsages for the kitchen staff one year at a girls camp, using these scouring pads, leaves out of the green scrub stuff, etc. People still talk about them. I like it, actually. I agree with most people that it is missing something, perhaps you could pull the bigger scrubbies apart into smaller rosettes or something like that. It has potential and I looooove the idea, so creative!!! I think this might work a little better if you used smaller scrubbies that look like the silver rosettes, but that’s just me. It still could be very Anthro though. The last time I was in the store, they had a display that had a display featuring a set of three, take an old empty bottle, cover it with random torn pieces of masking tape and antique it with brown shoe polish crafts that my mom did in the ’70’s. Actually, I think it’s ALMOST cute. Looks unfinished. Needs something in the spaces between the scrubbies. I like the materials you chose. 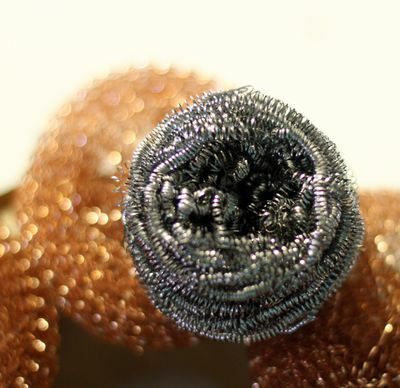 That copper color, the shine and the circle motif of the coils are really quite appealing. Put together as a wreath, though, I must admit I’m not sold. 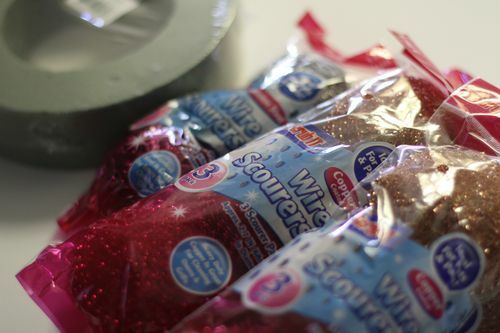 I think the wire scrubbies would look good tucked into the empty spaces of a kitchen gadgets wreath though. And may I say that I admire your ability to take honest critique from all of us. It is difficult to put yourself out there like that. 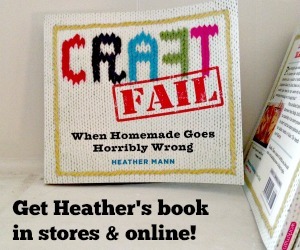 Super clever, Heather! :) I prefer the “fuller” wreath, and think it has a lot of potential. Very cute. Fun! And overall: amazing, especially considering your materials. You know what it needs, though? A little more spice and something to cover up the centers of the scrubbies to make it a little less obvious what they are. How about hot gluing some retro-y buttons from the stash into the centers? Or beads? Then they would look more like flowers and be a bit more tongue in cheek. Then how about some lace around the outside edge for more snarky 50s style commentary on the domestic life? Oh, and I also like the suggestion of wiring them like flowers and turning them to the side so that, again, it’s less obvious what you started with. Can’t wait to see how it turns out! Love love love it!!! I need to make one of these ASAP!!! This is a cute idea! I would improve it by unrolling the scrubbies. Some of them form a tube when unrolled, and that could be cool, or some of them form a sheet. But the ribbon, my dear, clashes. I suggest a mettalic-colored ribbon. I like the idea but I think it needs something as everyone else said. Why do you need a base to glue them on? I would think you could wire them to a circle of copper wire (just make several circles and wrap it firmly till you’ve got something sturdy) and how about sticking forks and spoons in between like people do with watsistcalled, holly? You could get cheap forks and spoons and bend them into interesting shapes and stick them through for interest or you could use plastic forks and spoons perhaps spraypainted? Just an idea. Oh yeah and a bit of dishtowel cut up scattered through if that wasn’t enough. Maybe make a hanger from a bent spoon/fork handle? Just something more kitchen-y? 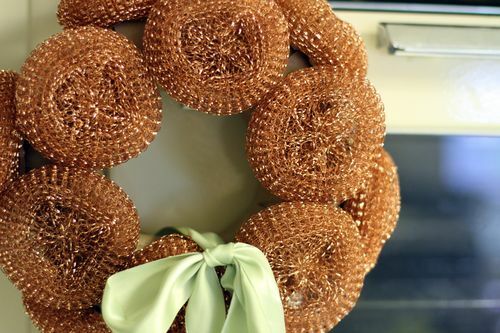 I don’t know how to describe this exactly, but what about turning the scrubbies sideways and stringing them (perhaps on a reused wire hanger) as the wreath body itself. You would probably need more packages depending on the size you wanted. I’m in agreement with most that the ribbon color isn’t exactly right…where exactly does copper lie on the color wheel? I liked the idea of the oxodized ribbon color, but I’m personally not into bows. Maybe the ribbon could be wound around the scrubbie-wreath in a striping effect. Just a thought. I hope you make more efforts and let us see your results. I love that you are willing to hear comments and take suggestions! Just think, if you wired the copper scrubbers onto floral picks or used U pins to attach them, you could actually use them and rearrange and add plastic scrubbers to fill any holes. When done, reuse the base again. Long may the Dollar Store reign!!!! I LOVE it… i think those that are on the fence maybe are just so used to seeing these for their usual use — scouring pads. If we grew up with these as a fabric or a craft supply, I bet we’d feel differently. I think it’s beautiful — the composition, the coloring. Love it! It just needs some finishing touches. Maybe you could insert something smaller into the openings left from the fact that the scrubbers are round. I’m thinking maybe leaves cut from those flat green scrubber sheets, or some other kitchen-themed item of the right size. 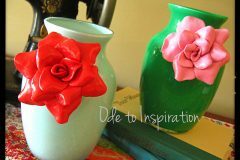 And I’d go for a brighter bow, maybe turquoise or green, or even a combination — I got some sheer copper-colored ribbon at Dollar Tree once, and it would look snazzy layered with a darker color. Cool idea, just needs to go a bit further. I like it and I think it looks perfect! yeah i’m with the dislike crew and also with the people who are picky about wreaths. i only have ever been tempted to buy one wreath (and promptly did) – one covered in multicolor giant sequins, from PierOne. but, the color of the scrubbers is nice and makes me feel that it should smell of cinnamon. so there is something right about it. I’m looking at it in October. Thinking about all of the beautiful autumn decorations, I thought of something. It’s the wimpy green bow that made it look not so great to me. I’ thinking that I’ll be headed to the dollar store to purchase supplies and then to the craft store for some awesome fall leave or Thanksgiving wire ribbon for a bow. I need a secret sister gift in a couple weeks. This with a canister filled with candy corn and a tea towel will be great! LOVE! 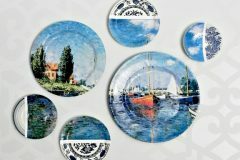 I am going to make one for my kitchen. I think I will try putting wire through the middle and lining many of them up then forming into a wreath. Very excited. I had the same idea as CASSIE. I think I will try threading a wire through the centers then join the wire to form a wreath. It could be adorned with the head of a vegetable brush and a few plastic leaves around the brush “flower”. Might be cute! Some embellishments might be mini kitchen tools I got for a dollar at Jo Anns fabric. Um, sorry, no. Most of your stuff I love, but this is just not looking good. The main thing with the wreath is: it’s your idea and if you like it then that is all that matters. As time goes on you can change it any way you want and each week have somethibg different. Play with it. Love the start of a good idea. What about pine cone center ends placed in center of each scrubbie. Cluster silver ones to side and a bronzie, coppery ribbon with a little glitter sprayed on ribbon. Add a little babies breath for filler and glue on retro buttons here and there. I love the idea and it looks smashing. Put it on top of a gift for a Bridal Shower perhaps. I realize I’m late to the game, but I just came across this. I love it!! I would make the bow out of wider material, and in a different color, but I absolutely love this. I’m going out to my local dollar store in search of copper scrubbies! Thank you! I like it it just needs touch ups. I think the silver scrubbing needs to stay as a focal point and add aluminum foil curly q’s to it underneath jetting out. And the ribbon to hang it should be made out of the elbow length dish gloves they have cute ones now maybe with a bow glued in middle where they’retied off. It has possibilities but not quite there yet. Needs to be bigger, fuller, maybe wire frame. Silver scrubbies for accent perhaps. Work with it gals, it can be awesome!! I like this idea but I think I’ll paint it. I love your idea. My daughter-in-law will be getting one for Christmas. I may make a few adjustments but think it is a wonderful idea.